Apple was busy on Tuesday, releasing more than a half-dozen software updates for the Mac enhancing and improving the performance of photo-editing apps, printers, Safari, and more. Leading the list—at least alphabetically—is the release of Aperture 3.4.4, which addresses an unspecified issue that caused the program to quit during image imports, and another bug that caused the app to quit when uploading images to Photo Stream. Among other stability and performance fixes, Aperture also now correctly displays raw images from the Nikon P7700 camera correctly in the import window; it now also correctly displays thumbnails with names longer than 250 characters. Also on the photo software front, iPhoto 9.4.3 was released with upgrades for compatibility with Mountain Lion. Users can now delete photos from Photo Stream by dragging them to the trash, or export them using the Export command in the File menu. The update also fixes problems with the rotation of photos shared to Photo Stream and a crashing issue that occurred when syncing images to Facebook, as well as issues creating calendars and books within the app. Tuesday’s releases also include Java for OS X 2013-002, which replaces Java SE 6 with a more secure and reliable version and Java for Mac OS X 10.6 Update 15, which performs a similar upgrade—though clicking on the link, as of Tuesday afternoon, takes you to a previous update from March. In addition, Safari 6.0.4 for Lion and Mountain Lion and Safari 5.1.9 for Snow Leopard allow users to enable the Java plug-in on a website-by-website basis, as a security precaution. 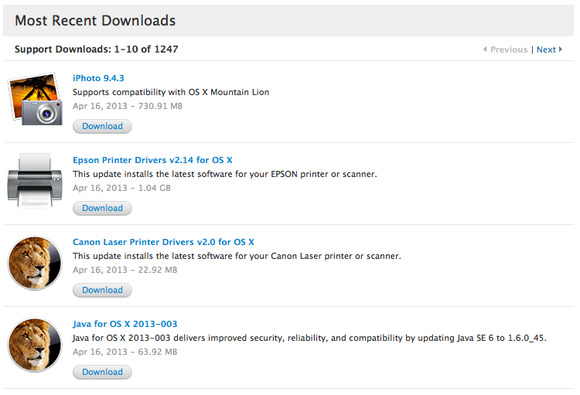 Finally, Apple released printer software updates for Epson, Canon, and HP printers. The updated software can be found either through the Mac App Store on your Mac, or through the Downloads page at Apple’s support website.